Opening on Thursday, January 12, 2012 at 6 p.m.
Koroska galerija likovnih umetnosti (Art Gallery Slovenj Gradec) hosts international video exhibition Video in Progress 3: Fields of the Performative. 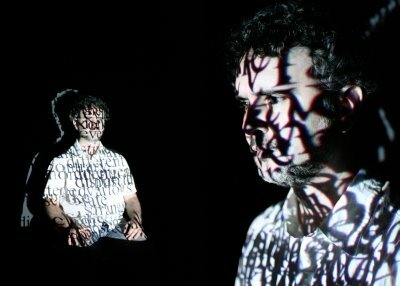 The third edition of the project, which in 2011 became a video festival organized by Kolektiva Institute and Photon Gallery, was first presented in 2009 at Kino Siska Centre for Urban Culture in Ljubljana (SI). Since then the project was presented in various forms in Gdansk (PL), Skopje (MK), Torino (IT), Rotterdam (NL) and Rijeka (HR). Three works directly address the topic of language and explore various methods of communication. In the performance Different, Zoran Poposki illustrates the influence of a society full of prejudices as to the image of an individual. The performer is, beyond recognition, covered with projections of words that express mainstream society’s view of those who live at its margins. The video Repeat After Me by Marianne Holm Hansen shows two persons in parallel who alternately repeat basic foreign language phrases lifted from a tourist guidebook and thus generate an impossible dialogue. In his video Quiet, Attila Urban uses two parallel pictures in a dialogue, which, with the help of universal gestures, form a peculiar narration.